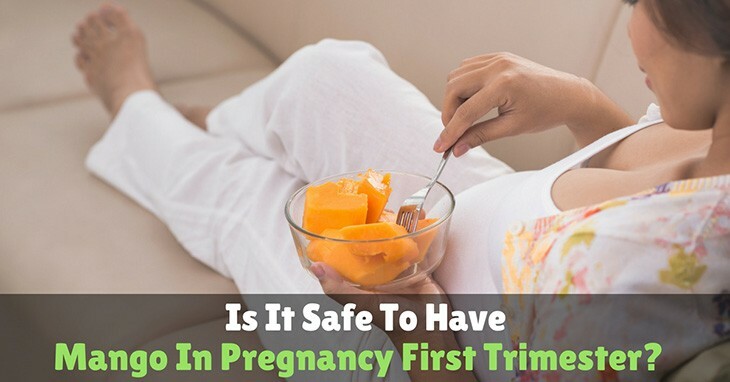 →Is It Safe To Have Mango In Pregnancy First Trimester? As you start the journey of pregnancy, you become more conscious of your health, especially when it comes to the foods that you consume. While some mothers crave for ice cream and cheese, most are craving for sour foods like cucumbers and mangoes. If you are craving for this fruit, you are probably wondering if it is safe to eat mango in pregnancy first trimester. Let us take a look for the health benefits and risks of eating mangoes during pregnancy. Is Mango ﻿I﻿n Pregnancy First Trimester Safe? Can I Eat Mangoes During Late Pregnancy? This fruit is actually good for you as it contains high levels of vitamins A, B6, and C, iron, potassium, folic acid, and other essential nutrient﻿﻿s that you and your baby need. Mangoes are also rich in antioxidants, fiber, and beta carotene, which are useful for alleviating constipation during pregnancy. Mangoes contain high levels of vitamin A. This helps in strengthening the immune system and maintains a healthy skin and mucus membrane. During pregnancy, this vitamin aids in the embryonic growth of the fetus. It also plays a significant role in the development of bones, heart, kidneys, eyes, and lungs. The potassium contents of mangoes help in controlling blood pressure and heart rate. It also helps in balancing fluids and electrolytes in the body. During pregnancy, too much fluid may lead to swelling of the legs and mangoes can save pregnant women from this problem. The volume of blood during pregnancy expands up to 50%, which means that you need more electrolytes. The vitamin C content in mango helps in fighting against the damaging effects of free radicals. During pregnancy, free radicals are dangerous for the development and growth of the fetus. The body needs antioxidants to fight them effectively and consuming mangoes can help you against free radicals. Vitamin C also supports neurological and cognitive functions. In addition to maintaining healthy gums and teeth, this vitamin aids in better absorption of iron. It also plays an important role in bone growth, healthy skin, and tissue repair. Mangoes contain copper that helps in the formation of blood cells. During pregnancy, the need for copper increases as the blood supply increases. This nutrient is also essential for the development the blood vessels, skeletal system, and heart. Folate plays a significant role in pregnancy as it aids in the formation of DNA and red blood cells. It also helps in the development of the heart and blood vessels. Folate deficiency may result in spinal cord and brain defects in the baby. Some doctors also recommend pregnant women to take folate supplement to avoid these conditions. The fiber content in mangoes can help in aiding the function of your digestive system. Pregnant women often suffer from constipation during the first trimester and consuming foods rich in fiber, such as mangoes, can help in preventing or relieving constipation. It also helps in keeping the blood pressure to a normal level. Studies have shown that vitamin B6 aids in alleviating nausea and morning sickness. Mangoes contain vitamin B6 that can relieve this common problem during pregnancy. It also helps in red blood cells formation and neurotransmitters. Also, it aids in the development of the fetus’ nervous system. Is Mango In Pregnancy First Trimester Safe? Yes, it is safe to eat mangoes during pregnancy. This fruit contains the essential nutrients that your body needs and is a good source of antioxidants and energy. The vitamins and minerals present in mangoes can also help in the development of your baby. Just make sure that you eat this fruit in moderation, just like the other foods that you will consume. Mangoes are also sweet, making them a better alternative to pastries and cakes when you are craving for treats. They are also high in calories and energy. During your third trimester, you will need to increase your calorie intake, so eating mangoes moderately is a healthy option. Ripe mangoes can also aid digestion, stimulate your appetite, and enhance the complexion. The last trimester is the crucial phase of your pregnancy. It is important to limit the consumption of mangoes as it can result in gestational diabetes. Make sure that you also pay attention to your body when eating not only mangoes but also other fruits. If you experience any kind of irritation, eliminate this fruit in your diet. It is also best to ask your doctor about the fruits and other foods that your body needs. 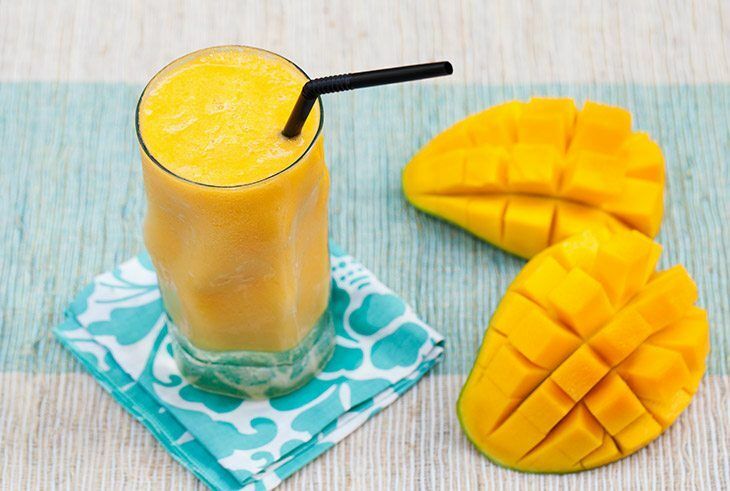 If you enjoy mangoes in smoothies, shake, or any type of dessert, always check the amount of sugar added. Watch out for added calories and sugars that come in the form of cream and sweeteners. Candied mangoes, chutneys, murabba, and dried mangoes contain added sweeteners, so only consume them occasionally. Since the olden days, it is advisable not to consume unripe mangoes during the last trimester as it produces heat. Pregnant women must be cautious when taking mangoes. Excessive consumption of mangoes during pregnancy may cause diarrhea. This makes you prone to dehydration and it is a serious problem during pregnancy. In addition to diarrhea, eating a lot of mangoes may increase the risk of developing gestational diabetes. Pregnant women have higher risk of getting diabetes and you can reduce the chances by avoiding certain fruits and foods. Before eating mangoes, make sure that you wash them thoroughly and peel the skin. 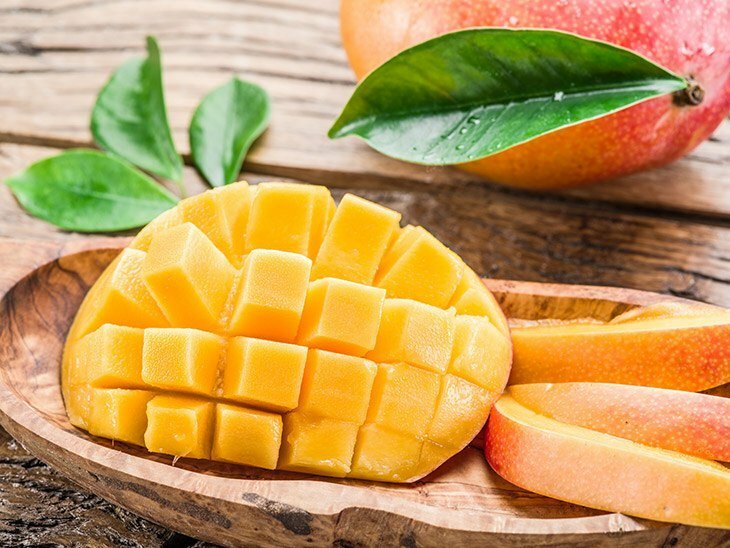 Mango in pregnancy first trimester is considered safe to eat as it contains vitamins and minerals that are essential for the development of your baby. Like anything else that you will be consuming, it is important to take this fruit in moderation. When buying mangoes, make sure that you choose carefully. Do not buy artificially ripened fruits to prevent side effects like stomach upsets, dizziness, headaches, and tingling sensation.